The sub-junior rowing team of Assam has brought laurels to the State winning two gold medals at the 21st Sub-junior National Rowing Championship held at Chennai from June 4 to June 10, 2018. 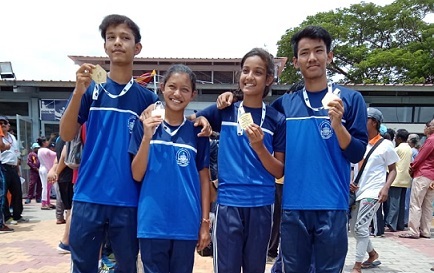 The pair of Subham Prit Borgohain and Udayaditya Borah won gold in the Challenger Men’s Double Scull event of the championship while the pair of Sameeksha Deka and Debashmita Kashyap won gold in Under-13 Women’s Double Scull event. This was informed by Assam Boat Racing and Rowing Association (ABRRA) general secretary Nababuddin Ahmed. The championship was organised by the Tamil Nadu Amateur Rowing Association and hosted by Shri Ramachandra Water Sports Centre (SWSC) on behalf of the Rowing Federation of India. Soma Barua was the coach of the 22-member rowing team from Assam that participated at the event. ABRRA authority during a telephonic conversation informed that both Subham Prit Borgohain and Udayaditya Borah hail from Sivasagar district of Assam while Sameeksha Deka and Debashmita Kashyap hail from Guwahati.